Welcome to our pages for providers of Access courses. Click on the links below for a range of further pages. We aim to provide an excellent service to colleges and other organisations offering LASER validated Access Diplomas. If we fall below your expectations in any respect please do let us know. Our standard office hours are: Monday – Fridays 9.00am – 4.30pm. Our main telephone number is 01227 811827. If we are busy you may get our answer phone. Do leave a message or email us on accessenquiries@laser-awards.org.uk. An Access Development Manager available to support your Access curriculum development needs. A dedicated Access customer support team based in our Canterbury office. An Access Quality Manager with responsibility for raising quality and standards across all of our Access centres. Regular Access News and Updates highlighting current issues. Termly Access Practitioner Group Meetings where tutors and staff get together at convenient locations across the region to discuss topical issues. Annual Access Conference/event with keynote speakers, relevant and useful seminars and the opportunity to meet Access staff and HE staff from across the region. A page with information on APGs – meeting dates, agendas, pre and post-meeting discussion documents, and links to ‘APG Web Presentations’ circulated in between meetings. A dedicated page on this subject where you can download a range of templates for recording student grades, designing assignment briefs etc as well as finding a range of advice and guides on grading. 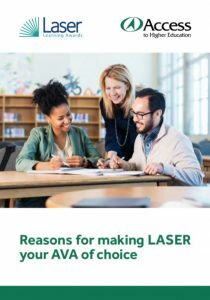 All of the key LASER policy documents and details of our procedures can be found in this section, along with general information and guidance documents. You can also find links to the full QAA Grading Handbook here. Contains an outline of how to register students online and the process for certification at the end of the course. The first subject areas in our online searchable unit bank of already approved selected Access units for use in designing new, or revalidating existing, Access Diplomas are now available. Other subject areas will be added shortly. This page contains information about the procedures for validating new Access Diplomas and revalidating existing ones as well as downloading the relevant documents. This page has training resources for centres to use with their staff.